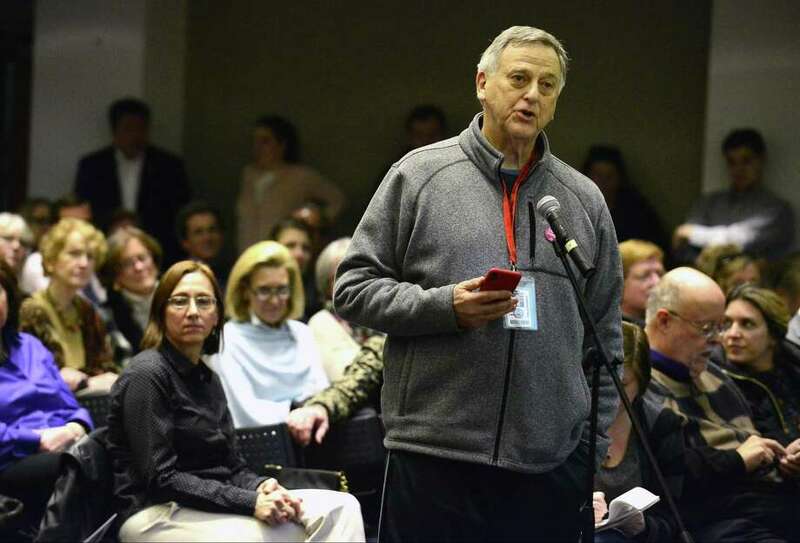 STAMFORD — Homeowners seeking to overturn a Zoning Board ruling that would allow a large fitness center in their neighborhood are a step closer to succeeding. Turn of River residents appealed the zoning decision to the Board of Representatives, whose Land Use Committee voted unanimously Wednesday to recommend that the full board reject it. The board will decide it Monday night. Residents filled seats in the government center’s legislative chambers and applauded after a meeting that lasted just minutes. They thanked the committee members, Annie Summerville, D-6; Anzelmo Graziosi, R-13; Nina Sherwood, D-8; Benjamin Lee, D-15; Megan Cottrell, D-4; Bob Lion, D-19; Charles Pia Jr., R-18; and Virgil de la Cruz, D-2. One member, Bradley Michelson, R-1, was out of town and could not attend the meeting. Residents have been fighting a proposal to build a high-end, 100,000-square-foot, indoor-outdoor health club, one of a national chain called Life Time Fitness, in High Ridge Office Park for more than a year. Three months ago the Zoning Board approved a change in zoning rules that would allow such a facility to be built in that office park and five others along High Ridge and Long Ridge roads. Office parks are increasingly hurting for tenants and city officials are seeking ways to repurpose them. Representatives on the Land Use Committee decided Wednesday the rule change isn’t the way. Lion said his concern is that the change does not fit the description of “adaptive re-use” of office parks called for in the city’s Master Plan. Lee said the zoning change needs further review. Cottrell said the developer did not make a case for such a facility. “We were told that this is a great savior for office parks but we didn’t have the data showing a demand for luxury fitness,” she said. She is concerned about the number of added cars such a facility would draw to an area congested with traffic coming on and off Merritt Parkway Exit 35, Cottrell said. De la Cruz said he rejected the Zoning Board decision on its merits. He is concerned that the rule change would affect future proposals for the other corporate campuses, Graziosi said. Sherwood said the rule change does not conform with the Master Plan. Summerville said she voted against the change “because of the outcry of constituents” in Turn of River and other neighborhoods. The issue began to heat up in February, when the Planning Board, which advises the Zoning Board, rejected a proposal to change a zoning rule governing office parks to allow stand-alone fitness centers. The Planning Board helped rewrite the Master Plan to allow corporate parks to be adapted for new uses so owners can attract tenants. But neighborhoods must be protected, Planning Board members decided. In May, however, the Zoning Board, which does not have to act on the Planning Board’s advice, approved the rule change. Residents of the Sterling Lake condominiums near High Ridge Office Park pooled their money and hired an attorney to do battle with attorneys for the owner, George Comfort & Sons. Joined by other residents who said they are worried about development in their neighborhoods, Turn of River residents gathered signatures to petition the Board of Representatives to review the Zoning Board ruling, as the city Charter allows. They gathered 700 signatures. But city attorneys rejected 560, saying condominium owners can’t be counted because they are not landowners. City attorneys also said a signature is invalid unless all inhabitants of a co-owned home also sign — a husband’s signature, for example, can’t count unless his wife also signs. That left residents short of the number of signatures needed for the Board of Representatives to review the zoning decision. They then asked the board to determine whether the signatures were valid. The board accepted their petition last month, then agreed to review the Zoning Board ruling.